The Theatre of Mistakes performed A Waterfall at the Hayward Gallery, during the first Hayward Annual in 1977. There was a different performance for each day of this 48 day exhibition. The piece was originally based on a timing device for another performance. On day 1, a single performer sat cross-legged between two buckets with a cup in each hand. She scooped water out of the first pail into one cup, poured it into the other cup, then poured it out of the second cup into the second pail. Each action lasted for twenty counts - so transference of water took 60 seconds per cupful. There were sixty cups of water in the first pail - so to empty it took an hour. Her last action was to pour all the water in the second pail back into the first pail. On the second day a second performer was added as well as a chair and the second performer held the second bucket between his legs - now the last action of the first performer was to pour water from the second cup into the first cup of the second performer. Thus a pouring chain was established. On the third day a table was added and a third performer. By the twelth day there were twelve performers arranged vertically above each other on a structure made of tables balanced on chairs balanced on top of other tables. The synchronisation of arm-movements was achieved by the recitation of chants - known as "Koans" - and all these chants were based on weather reports from off-shore regions of the British Isles. Each day's performance culminated in the pouring of the water in the top bucket into the lower bucket, so at every stage the lower bucket had to be within range of the upper pouring position - this dictated the nature of the structure. 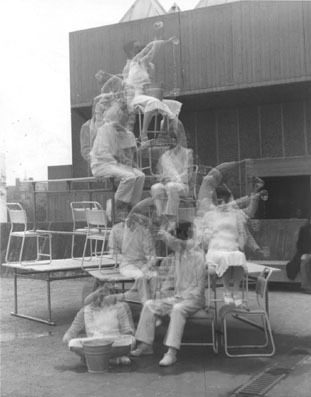 After twelve days, the performer cross-legged on the ground was removed and the lower bucket raised onto the first chair - so by the twenty-fourth day there was again only one performer, this time sitting at the height of the completed structure with a bucket on either side of him. For the next twenty-four days, the entire sequence of performance was reversed, and so the structure was dismantled and the last day was a reflection of the first day.